But as the dust begins to settle in Boston, and across the country, we are beginning to see some something positive: the tangible results of emergency management planning, training and exercises. In Boston, those preparations were clear as emergency medical services, law enforcement and others within the emergency management community worked swiftly and efficiently in its response to this horrific act. And as a result of this trial, Boston can take some solace knowing they practiced before the emergency to allow for a quicker recovery. That is resilience. Do you know how to spot the signs of a stroke? Today, May 7, 2013, is National Stroke Alert Day. San Francisco Department of Emergency Management’s Emergency Medical Services Agency is partnering with Bay Area emergency and health organizations to educate our community about the warning signs of stroke and the necessity of calling 9-1-1 if symptoms are present. Nurses from California Pacific Medical Center, St. Francis Medical Center and University of California at San Francisco joined forces with ambulance providers American Medical Response, ProTransport-1 and the DEM Emergency Medical Services Agency to distribute multilingual Stroke Alert postcards with stroke information at Embarcadero BART station. This is a part of a regional effort to spread good medicine at BART stations throughout Alameda, Contra Costa, San Francisco and San Mateo Counties. 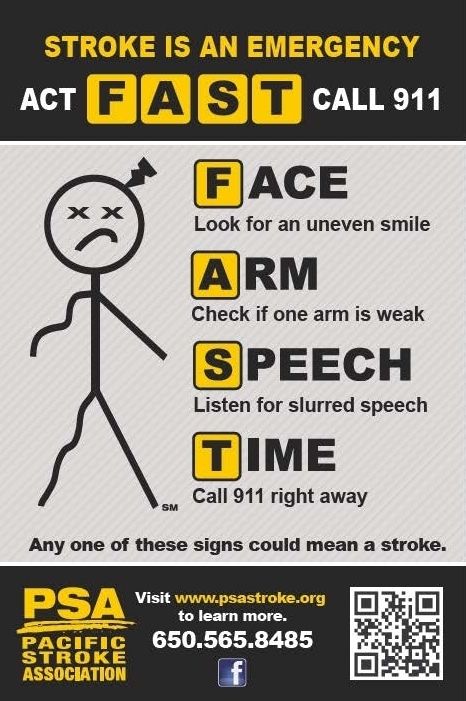 Using the FAST acronym is an easy way to recognize a stroke and know what to do if you see someone exhibiting the signs, according to Jenny Fung, R.N., the coordinator of Mills-Peninsula’s Stroke Program. A stroke is a brain attack in which blood and oxygen are cut off to a part of your brain. It can strike anyone, at any age. If you smoke, have high blood pressure, high cholesterol or diabetes you may be at an elevated risk for stroke. “Getting treatment as fast as possible is key to decreasing disability from a stroke,” Fung says. Nearly 800,000 Americans have a new or recurrent stroke every year. Of these, 130,000 die as a result of stroke. The City and County of San Francisco has a system in place to respond to strokes. Emergency first responders alert the closest of seven certified stroke centers that a patient is on the way, ensuring the hospital’s stroke team is ready when the patient arrives.